RI President Ron D. Burton unveiled the RI theme during the opening plenary session of the 2013 International Assembly in San Diego, California, USA, the annual training event for incoming district governors. Before the assembly, Burton asked each of the incoming governors to make a donation in their name to The Rotary Foundation in order to demonstrate leadership by example. At the assembly, he announced that all 537 governors-elect had complied; along with donations from all RI Board members and Foundation Trustees, the contributions totalled US$675,412. • 1961-1962 Act. Aim for Action. Communication For Understanding. Test for Leadership. • 1960-1961 You are Rotary - Live it! 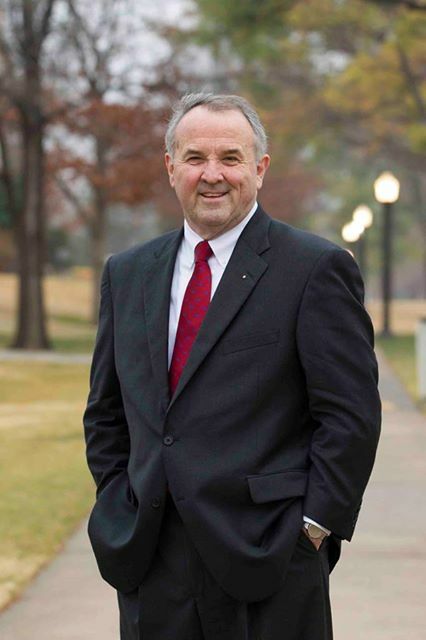 Ron D. Burton retired as president of the University of Oklahoma Foundation Inc. in 2007. He is a member of the U.S. Supreme Court Bar, the Oklahoma Bar Association, and the Cleveland County Bar Association. He is also a member of the American Bar Association, the ABA Section of Taxation Exempt Organizations Committee, and the ABA Section of Real Property, Probate, and Trust Committee on Charitable Organizations. He was vice president of the Last Frontier Council of the Boy Scouts of America and received the Silver Beaver Award. He also received the Norman United Way and Junior League Volunteer of the Year Civic Award. A Rotarian since 1979, Burton has served RI as director, president’s aide, RI president’s representative, committee and task force member, Rotary information counselor, zone trainer, International Assembly group discussion leader and moderator, Council on Legislation representative, and district governor. He also chaired the 2011 New Orleans Convention Committee. As director, he served as chair of the Executive, Administration, and Audit Committees. 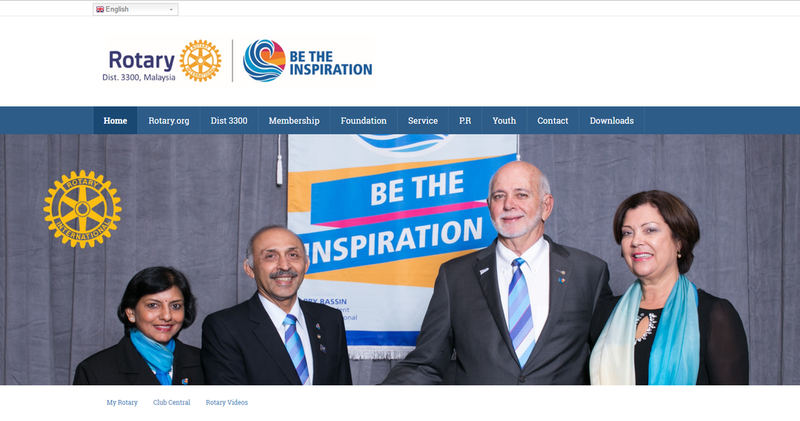 His extensive service to The Rotary Foundation includes vice chair and member of the Foundation Trustees, vice chair of the Future Vision Committee, and member of the International PolioPlus Committee and PolioPlus Speakers Bureau. Other service includes national adviser for the Permanent Fund Initiative, member of Permanent Fund Leadership Team, and consultant to the Development Committee. In addition, he has served as a regional Rotary Foundation coordinator and moderator of the regional Rotary Foundation coordinator training program. 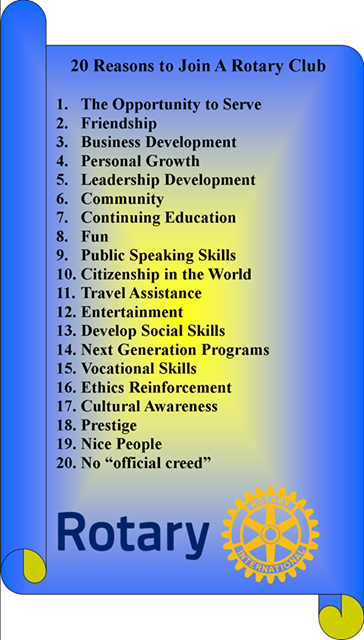 Rotary is a service club. This is perhaps the best reason for becoming a Rotarian - the chance to do something for somebody else. A basic human need - One of the two reasons Paul Harris began Rotary in 1905. Rotary clubs everywhere may assist in quickly obtaining services of a doctor, lawyer, dentist, etc., while travelling. The founder of the Kentucky Fried Chicken fast-food empire. At age 29, he was a founding member of the Rotary Club of Jeffersonville, Indiana. The Colonel went on to join two other clubs and remained an active member in Rotary until his death in his 90th year. He also wore cool white suits! The 35th President of the United States of America was a member of the Rotary Club of Hyannis, Massachusetts. Founder of the Easter Seals organization dedicated to helping people with physical disabilities. He was first an honorary member, then an active member, of the Rotary Club of Elyria, Ohio. His organization got underway when he convinced several Rotary clubs in Ohio to fund-raise to help address the needs of the many children physically devastated by polio. His organization was the first grant recipient of the Rotary International Foundation. Co-founder of the world-renowned Mayo Clinic in Rochester, Minnesota. Dr. Mayo was a member of the Rotary Club of Rochester, Minnesota and served as its Club President. The famous Arctic & Antarctic explorer and aviation pioneer was a member of the Rotary Club of Winchester, Virginia. It is reported that in 1922, Admiral Byrd brought his club's pennant flag in his expedition to the South Pole. He reportedly did the same in 1926 when he went to the North Pole. Inventor of commercially-viable wireless radio. Marconi was an active member of the Rotary Club of Bologna, Italy. In the 30's & 40's Toler starred as "Charlie Chan" in more than a dozen movies. He has an interesting connection to Rotary. Between 1914 to 1917, Toler, an American, was living in Halifax, Nova Scotia, working as an actor and playwright. He joined the Rotary Club of Halifax and was a member in the year his club sponsored the Rotary Club of Charlottetown. Toler left Halifax & went on to become a Broadway star. In the 1930's he took on the role for which he is most remembered - Charlie Chan . The 39th President of the United States of America, was, prior to his Presidency, a submariner (nuclear engineering), a peanut farmer, a State Senator, and Governor of Georgia. He was also a Rotarian. In 1984 he was awarded the Rotary International Award for World Understanding. Aviation pioneer & inventor, Orville Wright was co-inventor of the first successful airplane. He also was a member of the Rotary Club of Dayton, Ohio.